Isuzu Philippines Corporation (IPC) recently honored its top-performing dealerships at an awarding ceremony held at the Marriott Hotel in Pasay City. 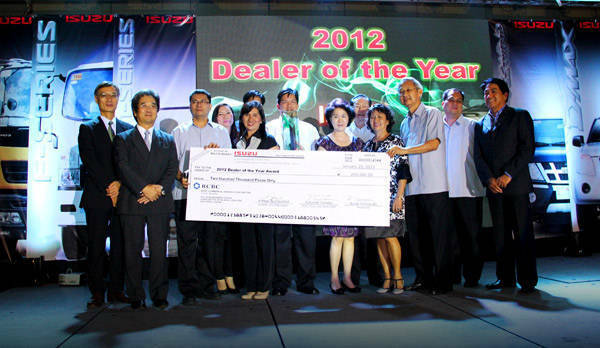 The much-coveted 2012 Dealer of the Year Award (DOYA) went to Isuzu Cagayan de Oro. In IPC's 10-year DOYA history, the CDO dealership has bagged the title four times. The second-best overall dealership for 2012 was Isuzu Alabang, while 2011 DOYA winner Isuzu Davao placed third. Isuzu Cagayan de Oro bested 20 other Isuzu dealerships based on predetermined sales and after-sales metrics, sales performance, implementation of sales support programs, maintenance of dealership facilities, parts and service compliance, and database operations parameters. Moreover, the CDO dealer was also honored with the following awards: Best in Parts Operation, Best in Service Operation, and Most Improved Dealership. Second-placer Isuzu Alabang was recognized as Best in Sales Operation, while Isuzu Iloilo was awarded Sales Team of the Year and Best in Customer Service Operation. Janelle Sola of Isuzu EDSA, meanwhile, was cited as Sales Executive of the Year. "The 2012 DOYA highlights our dealers' consistent compliance with our stringent standards, indicating their eagerness to support IPC's efforts in continuously improving customer service," said IPC president Ryoji Yamazaki. The 2012 DOYA and other awardees received trophies, cash prizes, and overseas trip incentives.